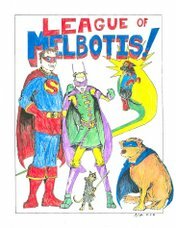 League of Melbotis: We're ready to believe you! I think the reason I've failed to get my ghost-hunting career off the ground is that I haven't been treating it like a business. Or, in fact, actually turned it into a business. I've never owned my own business, so I'm not sure all what I'd have to do. A) what kind of insurance do I buy for a ghost hunting enterprise? B) can I incorporate my ghost hunting business? C) do I list it as an entertainment business so as to avoid suits in the rare occurrence when I'm unable to locate a ghost? D) how much is a TV ad? I sort of think I'm more likely to get business through a TV blitz driving people to my easy-to-use web site. What else should I be thinking of? Franchise opportunities? Merchandising? Telvision rights? I'm thinking of it a bit like the professional palm reader. How do they get set up in a business of which many are skeptical? And how much should I think of charging so I can make a tidy profit? You need a theme song, too. Call up Ray Parker, Jr.
Dude, you'd have to list under exterminators. Then you could play the original "Ghostbuster" song until you're popular enough that they make you stop.